VisualV Fibonacci Cluster description and image. This indicator does take a little time to load, but it is well worth the wait. When you are trying to load a chart and it is time critical, we've added the ability to save a file which can be read by another chart. What you can do is create a workspace with all of the instruments and timeframes you trade. Load the correct number of days worth of data for each chart and load on the FibCluster indicator and set WriteAFile to true. Load this up at the beginning of each day or after the beginning of the new session. Then, you can shut down the workspace. In your "trading" workspace, you can just load 2 days so real time fibs can be calculated if you use them, or something like 500 bars if you don't. Add the FibCluster indicator to the chart and set WriteAFile to false. It will load from the file and will be much quicker. For 3 tick VBar charts, we recommend 16-30 days of data be applied. For 5 minute charts, we recommend 80-90 days of data be applied. For 30 minute charts, we recommend 120-150 days of data be applied. 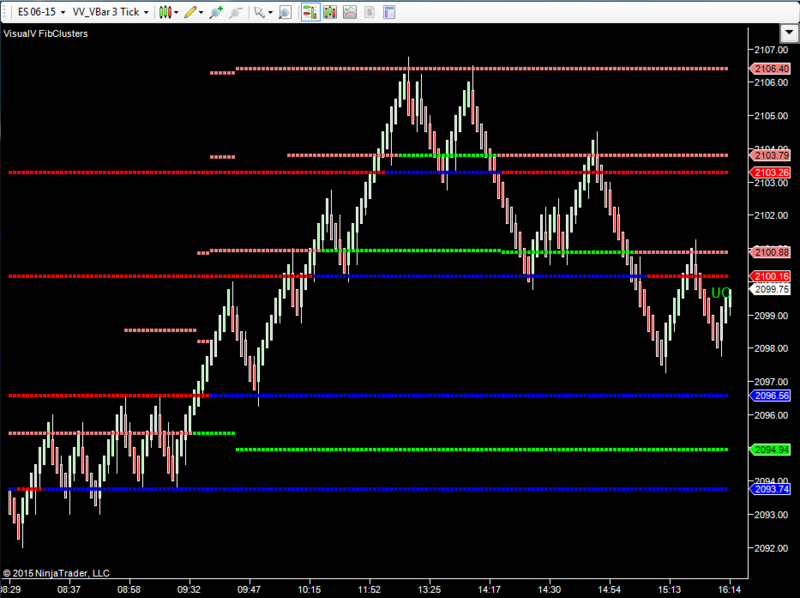 VisualVTrader's proprietary implementation of the historical and real time fibonacci clusters. Historical fib clusters are calculated from the beginning of the data until the session close of yesterday. Real time fib clusters are only calculated from the session close of yesterday until the current time, so these lines may change throughout the day. We use several different methods of calculating fibs and then use proprietary settings to determine when there is a clustering of fibs. This determines the proper placement of the lines. Remember, these are areas of support and resistance so a bobcob must occur before the area is considered changed from support to resistance or resistance to support, but they are very accurate. 5 lines of support and resistance near the current price are displayed to the user for both historical and real time clusters. On the image to the left, the blue and red lines are historical areas of support and resistance. The green and crimson lines are real time areas of support and resistance. These lines change color as the bar bobcobs the lines. The "marriage" of fib clusters and MML lines is an awesome combination. With proper understanding of how, when, and why resistance or support will hold or break, these lines are amazing.